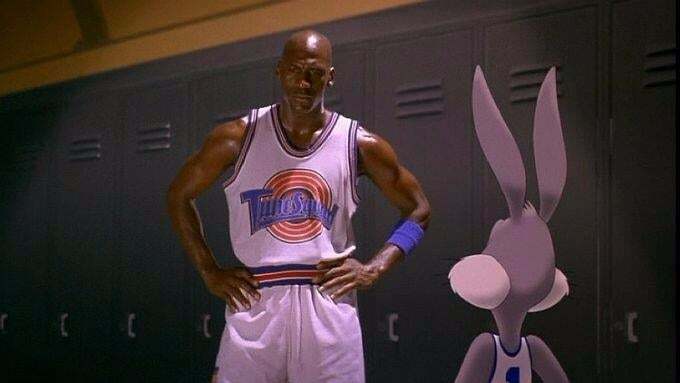 The idea of a Space Jam sequel is something that’s been in talks for a very long time, and we’re extremely excited now that it’s finally becoming a reality. A recent tweet from LeBron James’ production company, SpringHill Entertainment, shows what the basketball star will look like in the iconic Tune Squad jersey. “July 16, 2021,” the company wrote with a film camera, basketball, and carrot emoji alongside #SaveTheDate. As you can see, the tweet doesn't just reveal the release date, but also LeBron’s look for the film. The ensemble is pretty much exactly the same as Michael Jordan's outfit from the original movie. In addition to revealing some important info, the tweet also promises the return of Bugs Bunny and Lola Bunny. Bugs was pretty much a given, but the presence of Lola, who made her first appearance in the 1996 film, is extremely exciting for fans. The lack of women in the Looney Tunes universe is pretty unfortunate, so young girls in the ‘90s put a lot of stock into Lola. Many people were quick to comment on the post. “Bill Murray return, please? !,” @JoshThomas1994 requested. “2021? That’s like 600 years from now?,” @HighwoodDutch joked. While we don’t know much about the long-awaited movie, we do know that it will feel more like a reboot than a direct sequel. Last year, it was announced that Black Panther director, Ryan Coogler, would be producing the new animated/live-action hybrid and Terence Nance would take on the role of director. Nance is a director, writer, producer, and actor best known for Random Acts of Flyness. SpringHill Entertainment is a newer production company that launched its first TV show through HBO last year, a talk show called The Shop in which James and other athletes/pop-culture icons discussed issues at a barber shop. James previously appeared in episodes of Entourage and SpongeBob SquarePants before starring as a version of himself in Judd Apatow’s Trainwreck, where he appeared opposite Amy Schumer and Bill Hader. He most recently loaned his voice to Warner Animation Group’s Smallfoot. Space Jam 2 is scheduled to finally hit theaters on July 16, 2021.